The Minister of Transport, Abdullah Luaibi, announced the completion of the "East Kaser" of the port of Faw in the province of Basra in full. "The eastern breakwater is 8 km long and 200 meters long and was carried out by the Greek company Arcodion," a ministry statement quoted Laibi as saying. He added that "the Western Kasr, which is 16 km and 500 meters, and implemented by the company Daewoo Korean achieved 95%." The port of Faw is located in the Faw peninsula south of the province of Basra, estimated capacity as planned in the establishment of 99 million tons annually. Basra has four commercial and industrial ports: Maqal, Khuz al-Zubayr, Abu Flus and Umm Qasr. Iraq exports about 80% of its oil through Basra ports on the Gulf. Transport Minister Abdullah al-Obeidi said on Friday that the west wave breaker of the port project of Faw has reached 95%. "The western wave breaker is 16 km long and is implemented by Korean Daewoo," he said in a statement. 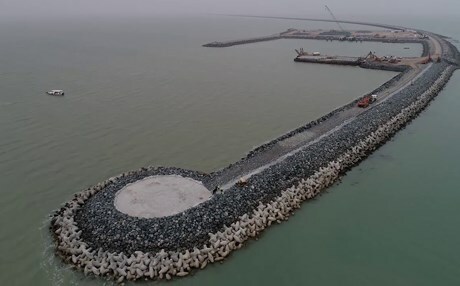 He pointed out that the breakwater of the eastern waves of length 8 km and 200 meters and implemented by the company (Arcordon) Greek, was completed in full.